There’s nothing Alaska Airlines pilots like more than a challenge. As a company that started out flying between remote airfields deep in the Alaskan “bush,” safely navigating where other airlines can’t is in Alaska’s blood. So, for Alaska, putting a flight in the path of the Great American Eclipse wasn’t really a question of if, but how. Total solar eclipses aren’t rare – they come around every 16 months or so. Being lucky enough to get in their path is the hard part. Diehard eclipse chasers, called “umbraphiles,” go to drastic lengths to put themselves in the moon’s shadow. They plan years in advance, strategically choosing the best places to catch each and every eclipse, whether that means scaling a mountain, chartering an Arctic voyage… or planning an incredibly complicated flight path. The math problem goes something like this: A plane leaves Portland flying 500 mph to catch a solar eclipse as the moon’s shadow decelerates from infinity in the instant it touches the Earth to approximately 2,400 mph approaching the coast of Oregon. 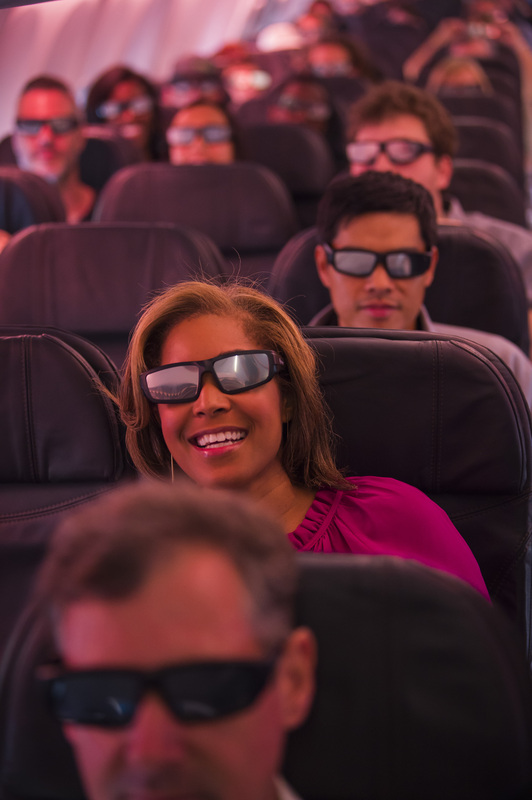 Where in space and time does the plane need to be to give guests the ultimate eclipse experience? It’s the kind of equation that takes a team of astronomers and aviators to crack. Enter Alaska 737 Fleet Captain Brian Holm, Alaska Airlines Captain and eclipse project pilot Hal Andersen and astronomer Glenn Schneider. Both Holm and Andersen have decades of experience in the cockpit. Schneider is an astronomer at the University of Arizona’s Steward Observatory and one of the world’s most esteemed umbraphiles. Schneider has been in the moon’s umbral shadow for 33 total solar eclipses since 1970. In 1992, Schneider even developed his own software, EFLIGHT (which you can read about in detail on Schneider’s website), to calculate flight waypoints for viewing of total solar eclipses. A match made in eclipse-chasing heaven. 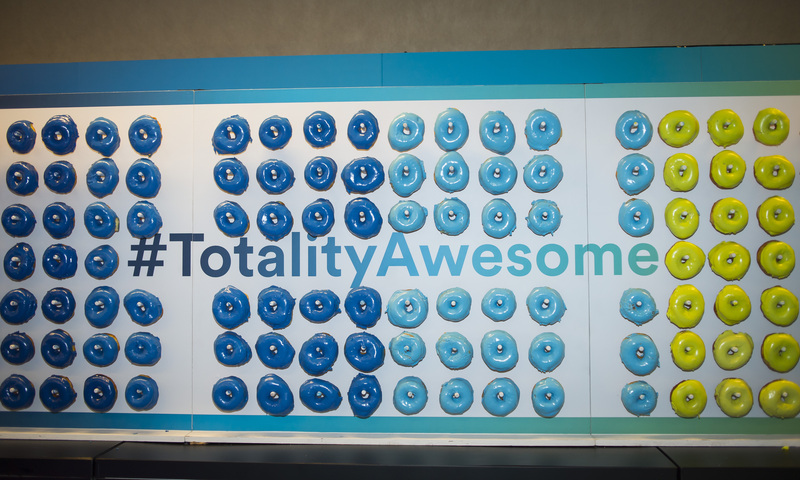 Together, they tackled the Great American Eclipse puzzle – an equation of three major parts that, if solved correctly, would give lucky guests the best view of the eclipse anywhere on the planet. Part One: Where’s the Sun? The first problem was determining where the plane needed to be to make the eclipse visible to guests at all. The flight would have to catch the eclipse with the sun low in the sky for guests to see the celestial mechanics at work. How low is low? To find their answer, the team measured the 737’s cabin, and the dimensions and placement of the windows on a Boeing 737-900ER. They then estimated the average guest’s seated eye level and the distance from the windows to find the optimal viewing angle. Long story short, the flight needed to catch the sun at an angle of less than 30 degrees above the horizon. Part Two: Where does the plane need to be? Beyond catching the sun at the right level above the horizon, the flight would also need to perfectly time its run across the eclipse’s path, putting the sun directly in guests’ line-of-sight as the eclipse reached totality. 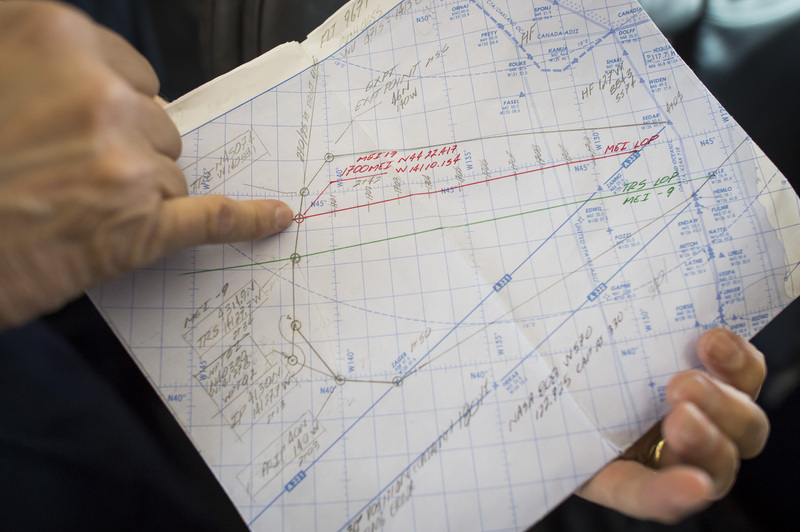 It was time to map out the “waypoints” – exactly when and where to put the plane to make the whole plan come together. That’s where Schneider took over. By feeding his EFLIGHT program variables including the required viewing angle, estimated aircraft speed, cruising altitude, anticipated wind speeds and more, the program produced three key waypoints and the precise times to hit them to view the eclipse. 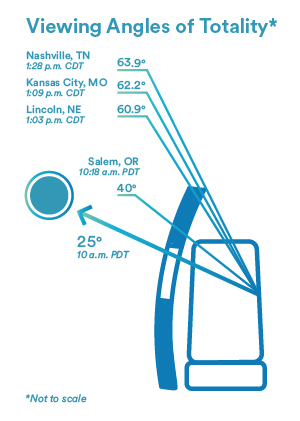 To make the eclipse visible from the windows of a typical airliner, the sun must be lower than 30 degrees above the horizon, with an ideal viewing angle of approximately 25 degrees. This ruled out flying over the continental United States to observe the Great American Eclipse. But as it turned out, those points were nowhere near… anywhere. To catch the eclipse at the perfect place and time, Andersen and Holm would have to lead their merry eclipse chase out of Portland to a point a couple of hours off the U.S. west coast, before returning back to where they started. Perhaps Alaska’s longest-ever flight to nowhere. But, much like Schneider’s celestial mechanics, an unstoppable plan was in motion. In less than 24 hours, Alaska’s leadership gave the OK to make the flight happen. Now it was a matter of planning, preparation and piloting skill. Part three: How do we hit the waypoints at the right time? As planning got underway, Captain Andersen outlined the problem to colleagues in football terms. “The eclipse is a pass from Peyton Manning… or Russell Wilson,” he quickly corrected, remembering who he was talking to (one of the perils of a 40-year career spent hopping between cities). With the moon’s shadow screaming across the globe at thousands of miles per hour, making up for lost time would be almost impossible. So, Andersen and Holm built a make-up point into the flight plan, or a “get well point” as Andersen called it in his days piloting C-130s in the Air Force. In other words, an opportunity to cut the corner on the flight path before hitting Schneider’s eclipse viewing waypoints, closing the gap on a late start of up to five minutes. 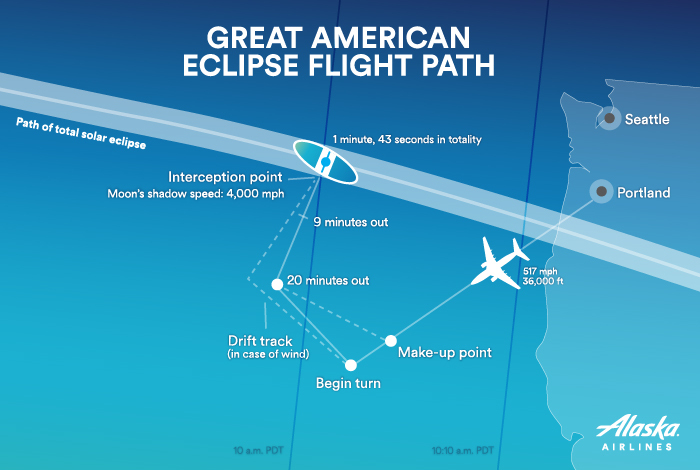 The flight plan of Alaska’s Great American Eclipse flight, including an optional make-up point where the flight could turn early to save time. If the flight ran more than five minutes behind, Andersen and Holm could attempt to catch the eclipse later in its journey as it neared the coast. The sun would be higher in the sky, negating the hard work to hit the perfect viewing angle, but allowing another few minutes of vital wiggle room. And wiggle room is important when it means the difference between the experience of a lifetime and long, uncomfortable flight back to Portland with a planeload of very grumpy umbraphiles. As a guest on the flight, you’d never guess at the hundreds of emails, calculations, charts and contingency plans that transformed the Great American Eclipse Flight from a wild idea into a workable plan. Unlike the usual flight’s mix of nappers, readers and phone fiddlers, guests buzzed with anticipation. Cheers erupted the moment the flight lifted off. When the fasten seatbelt sign went dark, the party started. Guests filled the aisle, reminiscing about past eclipse adventures, chatting with media, and collecting autographs from high-profile guests like NASA Astronaut Dr. Michael R. Barratt. Making up for his early pessimism at the five-hour flight plan, Joe Rao held court in row 9, waxing poetic about the views guests could expect as the moon eased in front of the sun. The mood on the flight deck was a little different, more like frenetic kitchen staff working behind closed doors to serve a seven-course masterpiece. A steady stream of course corrections, wind calculations and communications with Oceanic Air Traffic Control. Despite the pressure, Andersen hopped on the PA to sing a few bars of Europe’s “The Final Countdown” while guests led by Rao shouted “TEN! NINE! EIGHT!” from the cabin. Seasoned umbraphiles and first-timers alike pressed their noses to the glass, ravenous for a 103 second glimpse of totality that had been months in the making. And just like that, the moment was over. Sun and moon continuing on their way toward the coast, leaving behind an awestruck cast of eclipse chasers eager to touchdown in Portland and share their adventure with the world. They landed back where they’d started five hours earlier, but with a memory to last a lifetime. Nearly two minutes in the totality of a solar eclipse at 38,000 feet. A moment free of clouds and haze, only the thinnest of atmosphere between them and a phenomenon that has been equal parts feared, celebrated and honored throughout human history. Passengers on the Alaska Airlines Great American Eclipse Flight out of Portland, Oregon enjoyed VooDoo Doughnuts prior to the early morning flight. 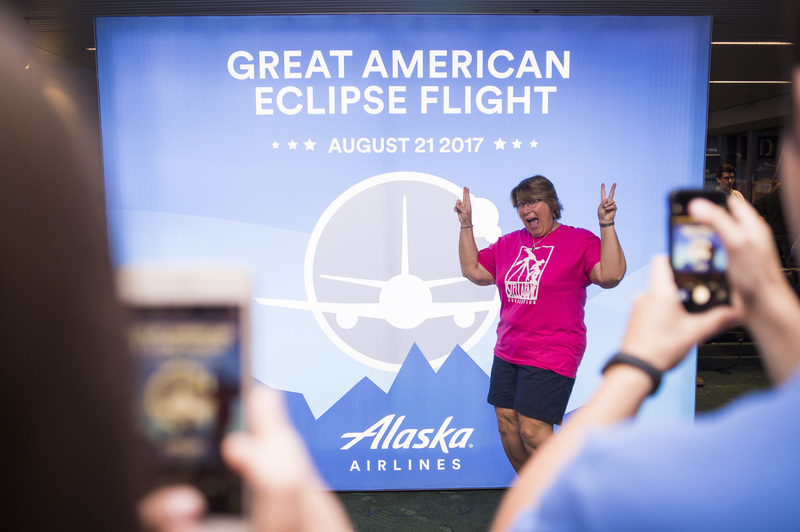 Kimberly Cassia, shows her excitement prior to boarding the Alaska Airlines Great American Eclipse Flight. Danielle Nottingham, with CBS news out of Los Angeles, sports some eclipse viewing shades. Brian Holm, Alaska Airlines pilot and 737 fleet captain, addresses members of the media prior the Alaska Airlines Great American Eclipse Flight. 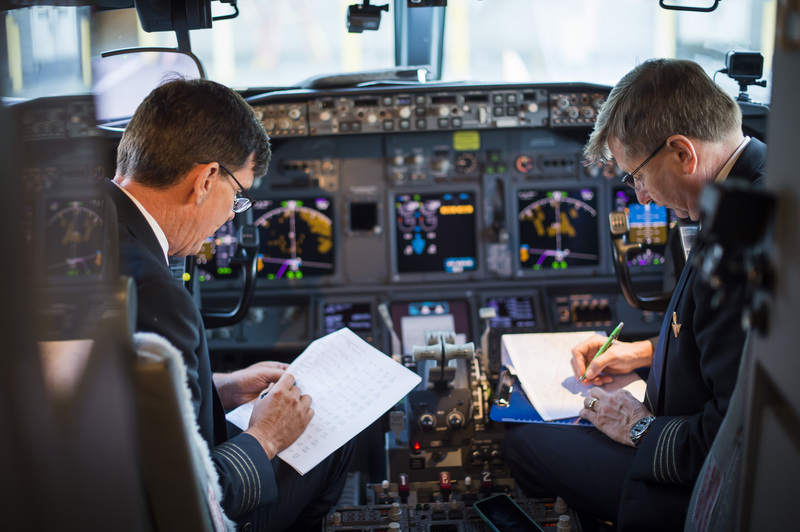 Alaska Airlines pilots Steve Fulton, left, and Hal Andersen go over the flight plans for the Alaska Airlines Great American Eclipse Flight out of Portland, Oregon on August 21, 2017. 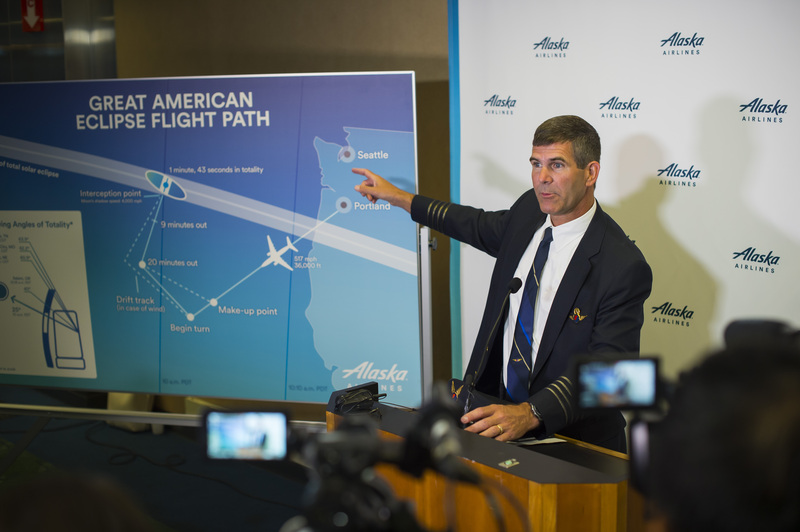 Alaska Airlines Pilot Hal Andersen shows where the Alaska Airlines Great American Eclipse flight path will intersect the zone of totality during the August 21, 2017 North American eclipse. 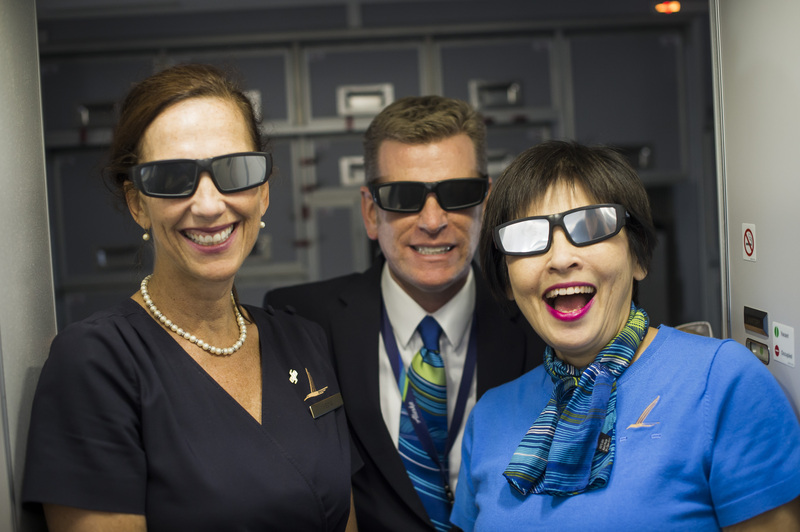 Alaska Airlines flight attendants Veda Shook, from left, Matthew Coder, Bev Bullock sport eclipse glasses while on board the Alaska Airlines Great American Eclipse Flight. Dr. Evgenya Shkolnik, professor of astrophysics at the School for Earth and Space Exploration at Arizona State University, and her son Reuben Dragushan chat during the Alaska Airlines Great American Eclipse Flight. 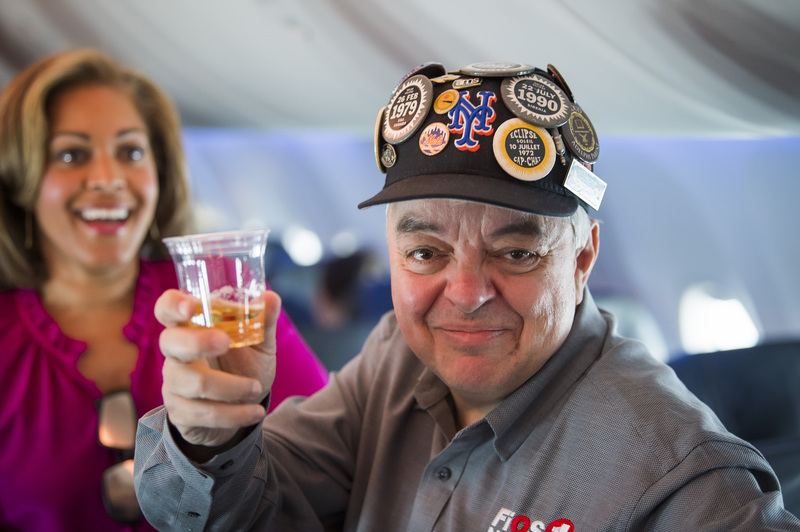 Joe Rao, instructor and lecturer at New York’s Hayden Planetarium, enjoys champagne following the Alaska Airlines Great American Eclipse Flight. 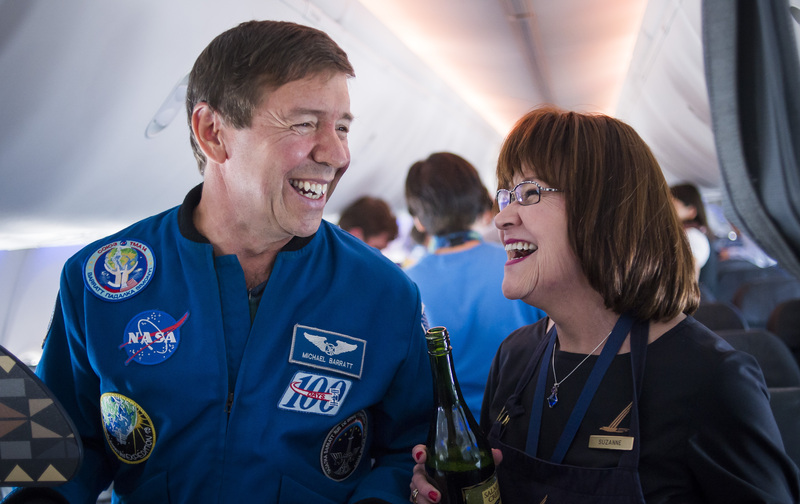 NASA Astronaut Michael Barrett, chats with Alaska Airlines Flight Attendant Suzanne Waldrop on board the Alaska Airlines Great American Eclipse Flight. 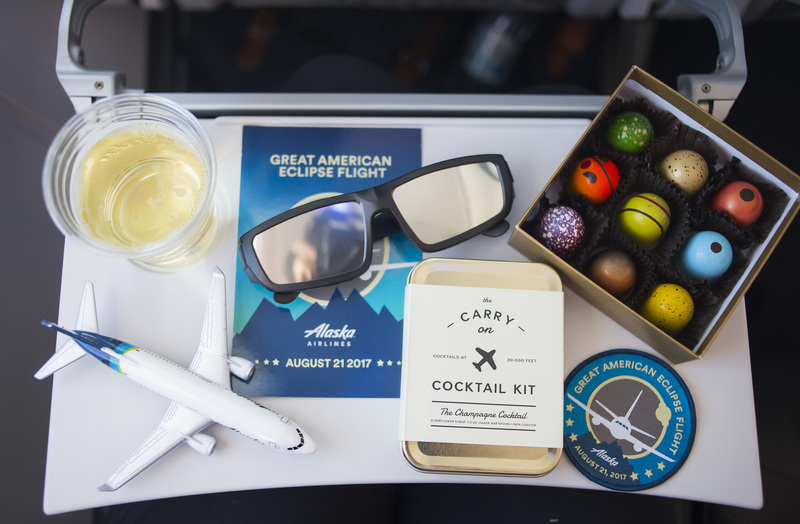 Contents of the schwag bag on board the Alaska Airlines Great American Eclipse Flight out of Portland, Oregon on August 21, 2017 included viewing glasses and liquor-filled chocolates. The moment of totality as viewed from Alaska Airlines Great American Eclipse Flight out of Portland, Oregon on August 21, 2017. Photos by Ingrid Barrentine/Alaska Airlines. 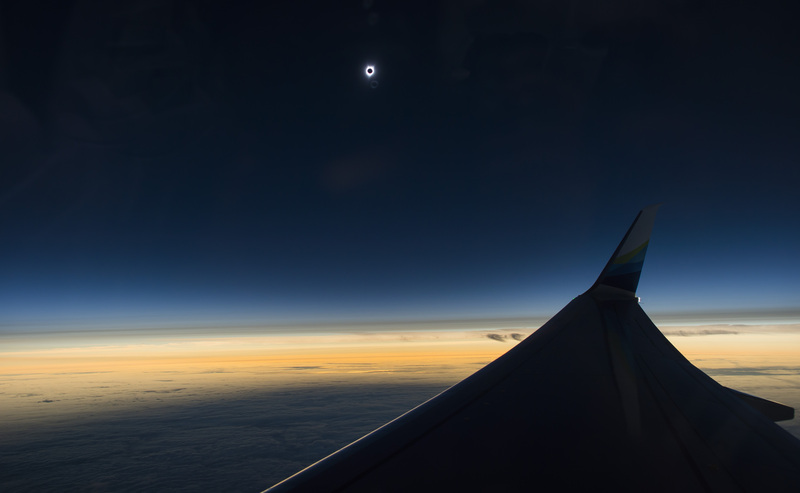 23 comments on "Threading the celestial needle: Catching the Great American Eclipse at 35,000 feet"
I hope you served your standard Pacific Northwest microbrew or wine during this flight! Awesome. Thank you both for planning this and for sharing how you did it… are you already planing for 2024? Really enjoyed reading this on my SEA –> Anchorage flight! Loved the Peyton correction. Curious to know more about who got invited? Hi Berto – glad you enjoyed the story! We have an impressive team of eclipse-chasers, and a wonderful partnership with Joe Rao and Glenn Schneider. On the flight, we hosted astronauts, planetary scientists, members of the media and a couple of lucky winners from our social media contest. Great work to the Alaska team. I was the aircraft commander on a USAF T-43 (B737-200 Advanced) that NASA commandeered back in 1977 to gather data on eclipses.. memorable flight, to say the least. This was an invite-only charter, special for the eclipse! We did host a contest on our social media channels to send two lucky winners and their guests on the flight. Still, inquiring minds are curious what the fare would have to be if this were offered as a flight you could actually book. Next one is April 8, 2024. When can we book our reservations? Thanks, Alaska crew, pilots, and staff! We passengers take for granted the planning, engineering, coordination, marketing and communications, teamwork, good fortune, and will to run a successful airline, and this looked to be a mission that highlights Alaska’s success in all those.. Incredible dedication from everyone involved to achieve the results the scientists, astronomers, and umbra lovers were looking for is just another example of why Alaska Airlines is the best ! This is why I love to fly with Alaska! (except my last flight that I got a crew probably recruited from United!)! Amazing story – and reading it while on an Alaskan flight back to Portland from San Diego. I missed the eclipse, but this is the best related story I’ve seen. Thank you! Would have loved to be on That flight! Beautiful shot! You guys did great with this! Southwest tried, but they didn’t put in the level of preparation and teamwork you did. Thank you! It was a phenomenal flight and epic journey that involved dozens of people throughout the company to pull off. From the pilots, marketing, corp. communications, charter coordination and Portland operational team, to the astronomers who guided us, this flight was a team effort. We’re thrilled with the result. Check out our GoPro video at https://www.youtube.com/watch?v=8FwF1DvksIQ . Do you have a high resolution photo available. It would make a great desktop background. Hi Matt! I have updated the image gallery to include a hi-res photo of totality. If you click on the photo, you’ll see an option in the bottom right corner to download. Very interesting article, a lot of it was beyond my comprehension. Exciting for the people aboard!